It is 2019 and making the best use of leisure time no longer involves planning outdoor activities. Almost everyone these days prefers to relax in their accommodations and watch TV shows. The Entertainment industry has been on a roll since the last decade. There is so much content to view. Moreover, accessing the content has become easier with time too. You can watch your favorite TV shows and movies on either your cell phones, computers/laptops or Television. However, at the same time, our attention spans have gotten significantly shorter. It has really become a hassle these days to just sit back and watch the same thing for over an hour without doing something in between. The prime example of this is using our digital devices while watching TV. 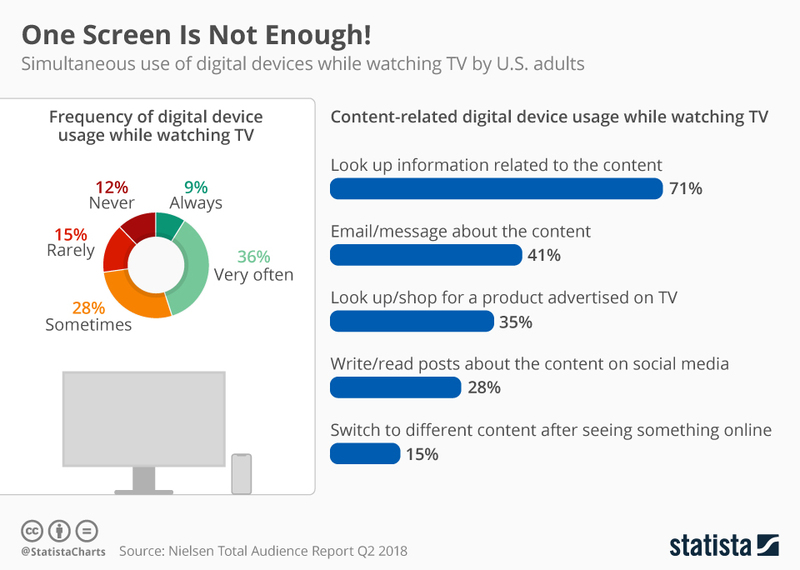 According to the most recent Total Audience Report by Nielsen, 88% of US adults use their digital devices while watching TV, either rarely, occasionally or frequently. However, most of them use these devices to look up for information related to the content on TV according to the same report by Nielsen, e.g. write emails and posts related to the content, discuss about it with their friends, read more about the content or search for the products being advertised on TV etc. Only 15% of these people use their phones/tablets to switch to different content than the one being shown on TV. This strongly signifies that one screen is not enough for the audience’s viewing pleasure and a second screen is a definite need in order for them to fully enjoy the product. Chart depicting the use of digital devices by US Adults while watching TV, courtesy of Statista.